An add-on bay with an overall size of 3048mmH x 838mmD x 2671mmW. It includes a single upright (3048mm x 838mm) and 8 beams (2591mm x 120mm). This add-on bay will fit a complete bay 838mm deep. When installed onto your existing complete bay It has a 2926kg load capacity per level with a maximum bay load of 8000kg. 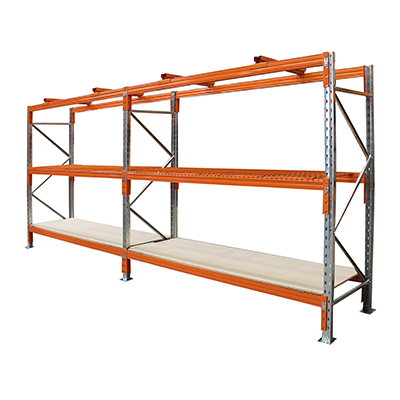 Pallet Racking Add-On Bay. An add-on bay with an overall size of 3048mmH x 838mmD x 2671mmW. It includes a single upright (3048mm x 838mm) and 8 beams (2591mm x 120mm). This add-on bay will fit a complete bay 838mm deep. When installed onto your existing complete bay It has a 2926kg load capacity per level with a maximum bay load of 8000kg.